This is an example of activism by animation. It’s not an information graphic so I’m not going to offer a critique, but I find it interesting that the economic benefits of coral reefs like tourism, fishing, and pharmaceutical discovery are foregrounded while environmental concerns like species biodiversity and ocean acidity are mentioned afterwards. Have a happy Friday, readers. I would love to see an animation of this quality that explained the process of ocean acidification and what we would have to do to reverse it. How much would our carbon emissions have to be decreased to make a difference at this point? And how much would that impact the typical American lifestyle? World Resources Institute. (9 July 2012) “Coral reefs: Polyps in peril”. Animation by Jim Toomey. Data on the availability of different foods per capita is adjusted for losses like spoilage and waste. Take for example the produce that goes bad at grocery stores or the leftovers tossed into the compost. By calculating such food losses, the USDA data closely approximates the amount of food that actually makes its way from the farm into the average American stomach. This leaves us with a decent proxy for what passes through the average American in terms of nutritional categories. I think they’ve done a good job of breaking the categories down – looking at added fats and sugars as their own categories is useful and infrequently done in the world of nutritional infographics. One more thing: this infographic is actually an interactive graphic that uses a slider bar to move across time. It’s a bit more pedagogically useful than the stills I have posted here. I encourage you to click through and play around with the full version of this infographic. 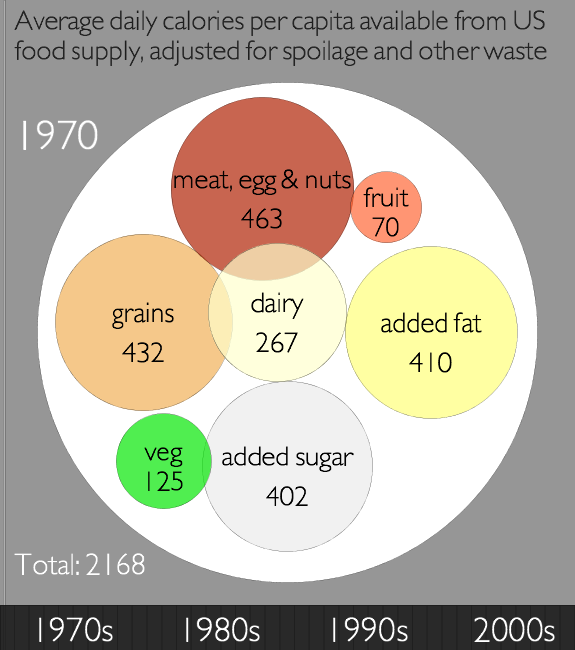 Adding up the 2008 numbers shows a total intake of 2678 calories per person per day up from 2169 in 1970. As an infographic, I think this could have done a better job of showing the growth in total consumption – maybe just a bar somewhere that is either broken down by category or not. This is a meaningful change. The purpose of the infographic is to communicate that the change has mostly taken place in the grain category but that’s a little tough to see. I imagine part of the reason it’s tough to see is the way the graphic is constructed – lots of things are changing besides grain. But it’s also a problem inherent in the numbers since grain doesn’t change all that much. However, I still think this could have been done more clearly without the bubble approach. 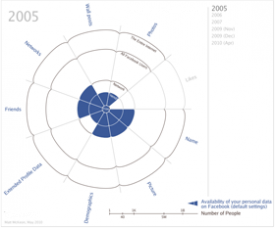 I still argue that the best way to show changes over time is by using line graphs. Humans are very adept at translating an upward sloping or downward sloping line. Of course, people tend to think that the upward and downward sloping lines are horribly boring and gravitate to bubbles and other mechanisms of pizzazzification. Jezovit, Andrea. (5 April 2011) Is Grain Making Us Fat? From the Civil Eats blog as part of an ongoing collaboration between Civil Eats and the UC Berkeley Graduate School of Journalism. If one graphic cannot tell the whole story, use three. Or four. Or four static graphics plus an interactive graphic (keep reading)! 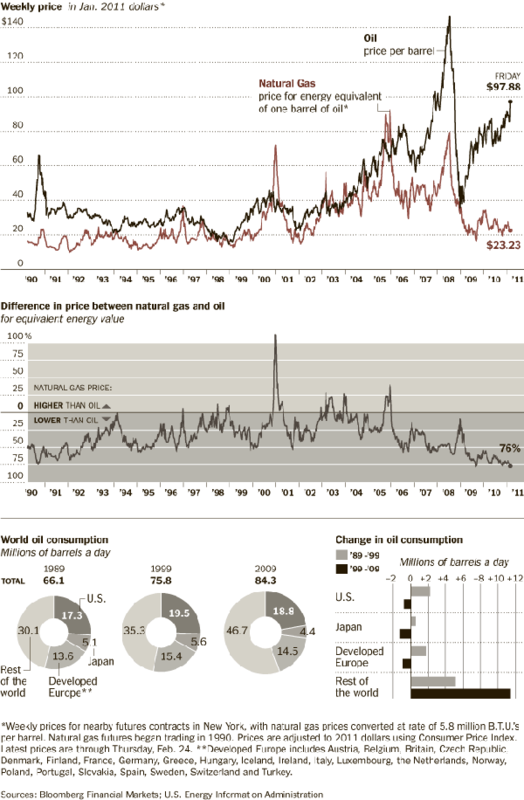 Most people would have stopped creating graphics after they produced the first graph – the one that tracks oil and natural gas prices from 1990 up to 2011. I appreciate the second graph which compresses the salient point from the first graph into a single line. It hammers home the point that what we are meant to notice is not the fluctuation in natural gas prices so much as the fluctuation in the difference between gas and oil prices. The other two graphics both deal with oil consumption only, something I find slightly odd given that the story is about natural gas. Yes, it is clear that there is a relationship between oil and natural gas consumption – we see that with the first two graphs. But we also see from the first two graphs that the relationship between oil and gas is not always predictable, especially not right now where natural gas is significantly cheaper than oil, cheaper than we would have predicted if we had to use the past as a guide. Yes, of course oil prices might go up as they respond to increasing demand from “the rest of the world” (weird terminology that means NOT US, Japan, or “developed Europe”). It’s also true that oil prices are sensitive to political unrest in the middle east, which has been underway lately in a number of countries. It is difficult to tell if these graphs are using numbers crunched before the revolution in Egypt and unrest in Middle Eastern countries or after. The graphic was published 25 February 2011, well after the Egyptian revolution began. But the weekly price is listed in January 2011 dollars which means the rest of the information might have preceded the Egyptian revolution. Still, the path towards divergence appears to have begun in 2009, which renders the timing question I raised a bit beside the point. And this is why we look at trends over long periods of time. Point estimates can be misleading. The Times has been covering natural gas regularly, and it seems they decided that more is more in pursuit of a fully comprehensive understanding of natural gas not just as a brute commodity being traded in a free market, but as a potentially harmful environmental toxin, especially when it is seen as being at the center of brutal extraction practices. There is an elegant slideshow-animation that describes how natural gas is extracted and explains what the consequences of this practice can be as a result of the mechanical changes the drilling process leaves behind. The combination of slideshow and animation works well here. If it were just an animation, it would be hard to fit the explanatory text within the temporal flow. Giving the viewer a chance to watch a small segment of animation and then read an explanation about what is supposed to happen and what can go wrong brings appropriate pacing to the explanatory experience. What’s more, I think it is a great idea to force the viewer to keep clicking in order to advance the slides. It’s barely above a fully passive learning experience, but anything that raises the level of participation – like reading or having to click somewhere – helps keep the viewer’s body and mind more fully engaged and pumps up retention. My favorite slide came near the end – these people built up some narrative tension. I kept wondering where this drilling process went wrong. So when do the toxins hit my drinking water? That’s what I was wondering, and this slide filled me in. It’s a simple question, one that we know we’ll find the answer to based on the title of the slideshow, but it’s always good if your viewer goes in with some direction. An obvious question is fine. Getting viewers to envision a more complicated question might be better, but overall I think this approach works well. 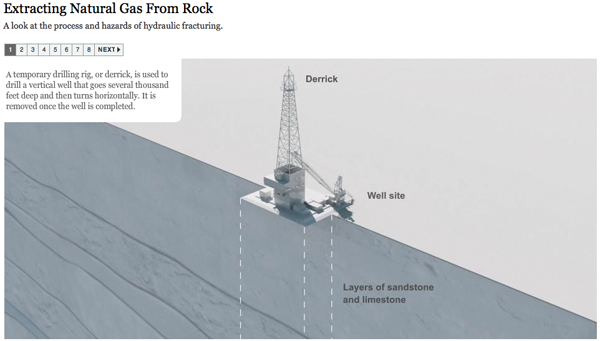 Please click through to make sure you understand why fracking presents environmental problems. I do not want to spell it out here because I think that would lessen your experience of the interactive graphic as a learning tool. Norris, Floyd. 25 February 2011 Two Directions for the price of natural gas and oil New York Times. Graham Roberts, Mika GrÖndahl and Bill Marsh. 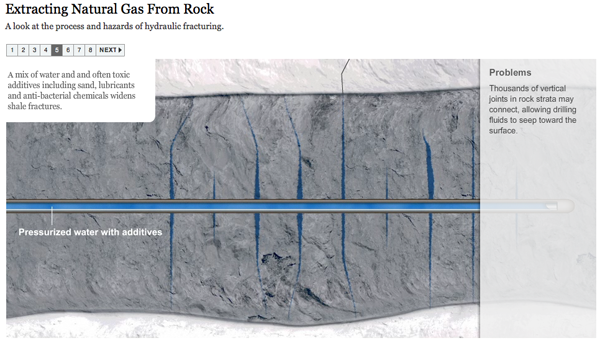 26 February 2011 Extracting Natural Gas from Rock [Interactive Graphic]. The New York Times. It feels like swearing to talk about fracking. Thank you, Battlestar Galactica. Regardless of where you stand, it has been a little hard to understand just how Facebook’s privacy changes are, well, changes. The series of graphics above eliminate the need to read dry legalese (or even those New York Times articles) and allow us to see the changes. The graphic is interactive and I encourage you to click through and play around with it. Among it’s great features, it allows you to select the privacy settings so that you can see just which bits of your personal data you can still protect and which bits are out of your cyber control. There is nothing that needs work about this graphic – the author explains his methods and assumption, invites comments, provided this graphic from the motivation to make information free, and he provides full-disclosure about what he does for his day job (works for IBM Research at the Center for Social Software). Holson, Laura. (8 May 2010) Tell-All Generation Learns to Keep Things Offline. In The New York Times, Fashion & Style Section. McKeon, Matt. 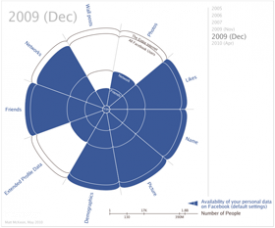 (May 2010) The Evolution of Privacy on Facebook. Personal website. Nussbaum, Emily. (12 February 2007) Say Everything. New York Magazine, Features. Perez, Sarah. 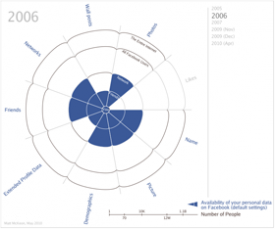 (20 January 2010) The 3 Facebook Settings Every User Should Check Now. In The New York Times, Technology Section. Valentino-DeVries, Jennifer. 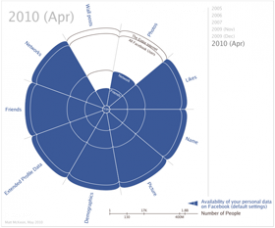 (26 April 2010) http://blogs.wsj.com/digits/2010/04/26/getting-control-of-your-facebook-privacy-settings/tab/article/. In the Wall Street Journal, Digits Section. Stanley Lieberson’s “A Matter of Taste” looked at the way trends spread by examining baby names. He wanted to avoid the impact of marketing and advertising – the point was not to figure out how to create, perpetuate, or stop a trend, but to see if there is such a thing as a trend in the first place. Nobody is in the business of promoting baby names, and yet there are patterns. Lieberson looked for these patterns in the US. French sociologist Baptiste Coulmont has also looked at the way baby naming trends move across space and change in popularity over time. The graph below shows how the final syllable of female names has changed over time. 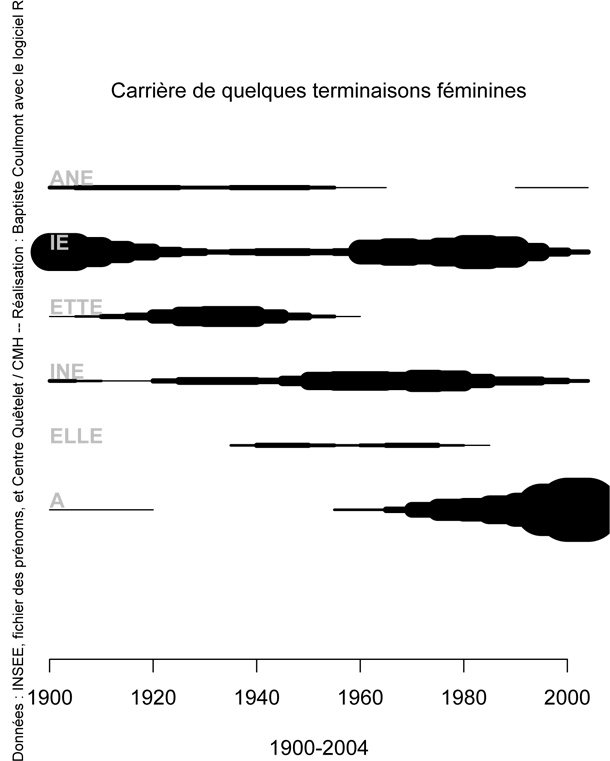 The -ette ending waned in popularity while the -ine and -a or -ah endings have increased in popularity. 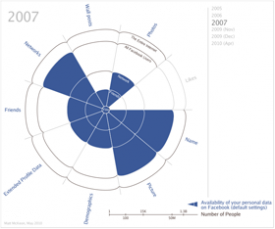 Graphically, I love that this diagram looks like sound intensity diagrams. More interesting yet, Coulmont also animated a map to show how the name Loic spread from Brittany across the entire country over the course of about 60 years. 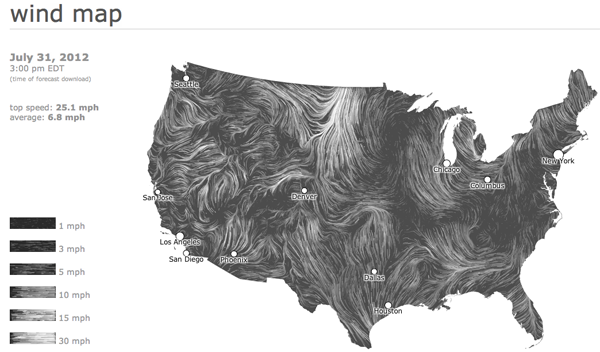 I like this because it takes a static map and makes it dynamic. Sure, you could have lined up maps to march across a page at five or ten year intervals and cognitively filled in the blank spots. 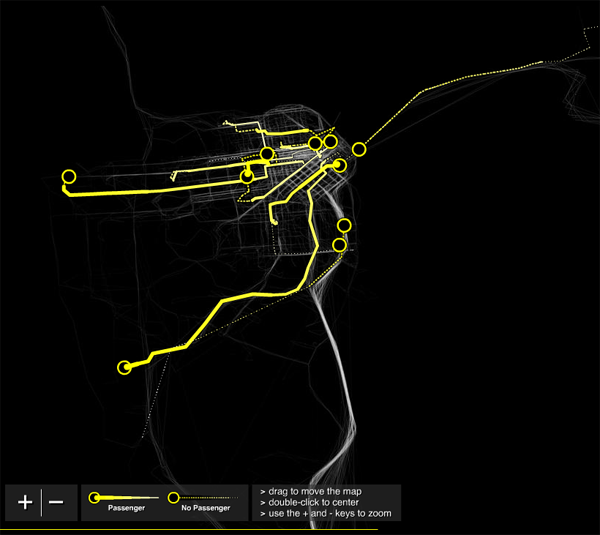 But here, his animations do the cognitive heavy lifting for you, revealing the pattern instantly. “As to my animation : there is no yet an accompanying sociological argument. I was struck by the spatial mobility of “Loic” from 1945 until 2005 : it seems to be a steady eastward shift [nowadays, Loic is one of the 20 top names for boys in francophone Switzerland : the eastward movement jumped the frontier! Coulmont, Baptiste. (2009) Prénoms typiques. Lieberson, Stanley. 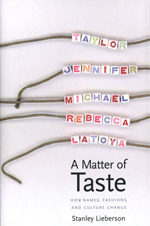 (2000) A Matter of Taste: How Names, Fashions, and Culture Change New Haven: Yale University Press. 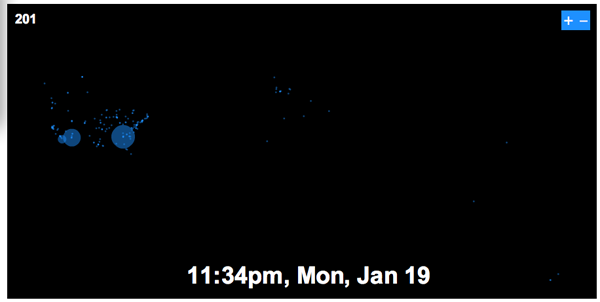 This is an animation based on twitter data from Obama’s inauguration day in the US – Inauguration was at noon. In case you weren’t a twitter user at the time, it is worthwhile to point out that twitter had partnered with Facebook for the day to increase usage. Both twitter and facebook were encouraging users to point their comments towards the topic of the inauguration. I like it because its like watching fireworks from above and gives a tangible sense of the excitement amongst Obama fans that day. Best thought of as an emotional animation of political temperature than as any kind of quantitative data. I wouldn’t even call it an information graphic/animation. I would call it popcorn, animated. I have the same problem with this animation that I have with twitter which is that I really don’t know what good they do, even though I’m intrigued. I’ve been trying to figure twitter out by using it and I still don’t see the appeal. Thus, it is quite alright to think this animation is pretty, but dumb. 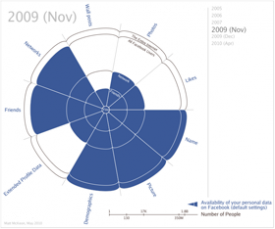 This post used to source a population growth animation from zachofalltrades.net but that website is no more. The University of Kentucky Appalachian Center is better, so count yourselves lucky if you missed the original post in favor of this update. First, you must click through and watch the animation. Praise #1: yay for gifs. Like the previous post that looked at China, this animation is trying to tell a story about population growth over time. The major difference is that the Chinese example was strictly demographic – looking at variables like gender and age but not at all concerned with geography. This one shows both geography and population growth though it does not include information about gender, age, race, etc. 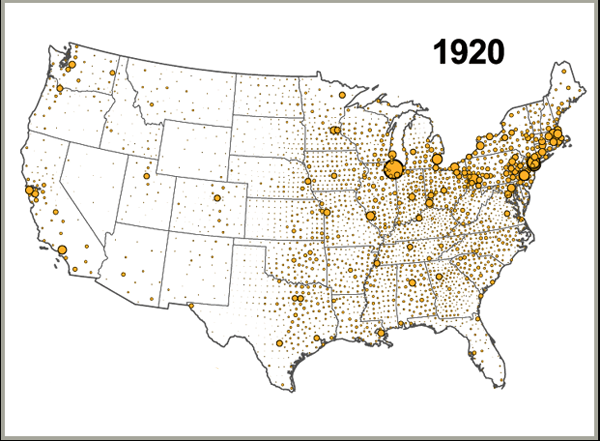 If this graphic were three dimensional, if density piled up, it would start to ‘feel’ heavier over time so that the same way that the westward expansion of the population just appears without you having to puzzle it out, the density of population in cities would be simply obvious. This is not meant to be a dig to the graphic’s creator. I just offer this critique as a way to think about just why and how ‘seeing is believing’. Watching the population move west is certainly a ‘seeing is believing’ moment because viewers do not have to think, they just have to watch. Realizing that the population of the US is now hugely larger than it was back in the 1880’s actually takes a little thought. You have to realize that not only did people move west, but they continued to live in the east in greater densities which is indicated by the size of the yellow circles, but would be even more obvious if the cities were like little hillocks on the landscape. Big yellow dots equaling density requires a move from the ‘seeing is believing’ to something else. If, however, the map grew in the third dimension as a more direct representation of the mass of humanity sitting on the face of the earth at these locations, we’d be back in ‘seeing is believing’ territory. A graphic that is a ‘seeing is believing’ creation is instantly legible and can free your brain to think about other things which is a good thing. On the other hand, a graphic that achieves a ‘seeing is believing’ mechanism will end up obscuring complexity. This is good when that complexity does not add to the ability to think through the next set of concerns, but can be a serious drawback. It is good to be able to get a diversity of people able to quickly grasp an argument, but there is a danger in presenting an hermetically sealed glossy image. My apologies for failing to post for a few days. If you noticed, I’m flattered. I had some deadlines and limited access to the internet late last week. Unfortunately, March is a very busy month and I will likely have this problem again before the month is out. I’ll try to make up for it when I can. I have always been a fan of the population by gender and age chart, even in the static form that you see before clicking through above. It is quite an achievement to clearly represent three different variables on a two dimensional graph. It helps immensely that gender here is a binary value. If it were tertiary or tertiary plus, this strategy would fall apart. Once you click through, you’ll see that the animation adds yet another variable, time. And time is a real kicker here. 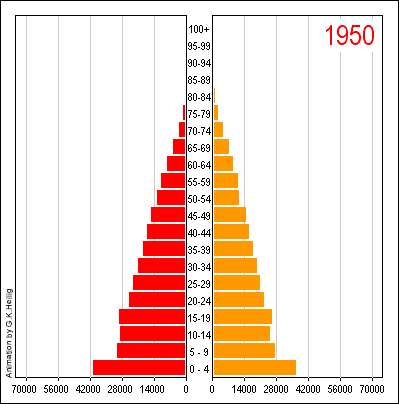 You can see how China’s population goes from having many young people and few old people to 2050 where the largest category is between 60 and 64 years old. Great way to take an old graphic technique – the static version – and animating it. The colors and overall treatment of the graphic as a designerly element. Red and orange makes it look a little like it’s yelling ‘Caution! Proceed at your own risk!” the whole time. But then, I guess we all have to worry about what is going to happen when the population pyramid becomes a slender pillar with an ionic capital.